And applause to Boyfriend for successfully promoting two polar opposite concepts at the same time, in two different countries. 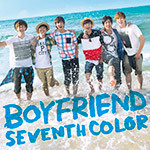 This PV should drop with the release of their album ‘Seventh Color’ which is due out on July 23 (wae so far away??) Then again, Japan are very fond of only releasing short versions (aka like ALL of the TVXQ! totally forcing me to buy the versions that come with the DVD) There are 3 versions available, and I am seriously considering getting two (because I’m a bit obsessed like that). I normally only get one, but this is going to be very hard to resist. Boyfriend are definitely one of the busiest groups in KPop right now, with back-to-back-to-back promotions in Japan and Korea lined up for the next few months. This evening they performed one of their ‘Love Communication’ showcases in Tokyo promoting their new single ‘Start Up!’, next week they will be back in Korea for their comeback ‘Obsession’ and on July 23 their second Japan Album ‘Seventh Color’ will be released kicking off yet another set of concerts and performances. *phew* I don’t think those poor boys will be getting much sleep at all in the upcoming weeks! 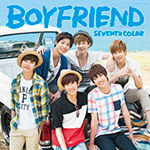 Boyfriend are a group that I definitely love. I’ll admit to resisting them for a while as soon as I found out their overall concept of cute, more cute, piled on top of even more adorable and compounded with more than a few underage members… There was a big NOOOOOO followed by a period of denial of all cutie boys. Then Teen Top wormed their way into my heart and the cutie boy deluge began. Yep – I can safely say that I definitely have a thing for cute boy bands – even back to my teenage years. That’s not to say Boyfriend are permanently adorable – they do try different concepts, and now that their youngest is finally 18, they are about to branch out into a more mature look (more on this later – expect DENIAL and crying kekeke). Well aren’t they just adorable! 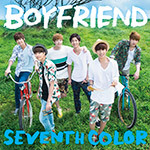 This isn’t anything drastically different for Boyfriend – it has all the hallmarks of several of their previous PV’s. It’s very similar in plot to ‘Pinky Santa’ where the Boyfriends all group together and help a girl with her love problem and then romp cutely for the camera. I’d like one of those magic keys in my life as well – particularly if it’s hand delivered by one of these cute boys! I always like how positive and bright their PVs are – and they make me happy to watch them. They always make a lot of eye contact with the camera, so it feels like they are singing directly to you. 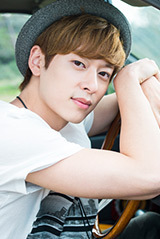 Boyfriend like to show a lively, cheerful, happy image and this PV delivers that in spades (in metric tonnes actually). The song has an upbeat tempo and all members share the lines pretty equally. The lyrics are also pretty sweet – as they’re all about giving encouragement and love and starting a bright future together. The chorus is also fairly catchy – lots of 愛してる (aishiteru – I love you). If I translated the line right it means ‘I love you, that word only makes me stronger‘ Awwww! I have ordered the First Press Limited Edition of this single – and it’s going to be just adorable! Aaaand this is a 180 degree shift! So… I’m actually pretty OK with this! I like it when the groups that I follow try out new things. From the looks of things, this might be a ‘Lost Boys’ concept – seeing as Peter Pan is featured on the “Wanted” sign. I definitely like the sound of the song – I have a lot of hip hop and rap in my faves list now. 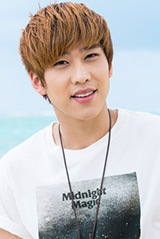 Hyunseong was also looking pretty fine – thank goodness he’s over 20 and I can at least not feel quite so pervy appreciating his abs there. Hooray! I wasn’t expecting this announcement until much later in the year! At this point only a few teaser images of the album covers and concept photos have been released on their official page. Pretty sure that this is going to be a combination of my two favourite Japanese PVs of all-time. 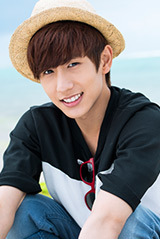 SHINee’s ‘Boys Meet U’ and Infinite’s ‘She’s Back’ what with the beach setting, bicycles, cute hats and summer theme! What a week (and a bit) of non-stop KPop releases!! Beast’s new PV for Adrenaline technically came out last week – but I have been too busy to review it until now! We were online in anticipation for Infinite’s ‘Last Romeo’ – just in case Woolim decided to go for a midnight release – alas no, but instead we got surprise Beast! The best kind of surprise! This is another perfect summer song – it’s got an upbeat drum rhythm as well as guitar riffs and, like a lot of recently released music, has a real throwback 70’s vibe with the synth chords. I like all of Beast’s dance tracks and this is quite a catchy song from them. I’ve already memorised the chorus! This fits well with Beast’s other Japanese discography. They have a wide range of styles and have their own unique sound. I was lucky to see them in a concert in Korea last year – their B2uty concert in Busan. My girlfriends and I screamed to our heart’s content and fangirled along with a bunch of what seemed like 14 year old girls through all of their hit songs and solo stages. They definitely made an amazing live show! I’m looking forward to this single arriving in the mail next month (along with like a million other Japan singles and albums). The PV is linked below, so enjoy! TVXQ! Released the short version of their new PV for ‘Sweat’ today! *commence glee* Seeing as they are in my top 5 and I’ve been a long-time fan. I especially love their Japan discography – even as it bankrupts me. Seriously this is like the 5th thing this year already. I’ll have to wait until my album arrives to see the whole PV (alas!) as they tend to only release these short teaser versions online. Yunho and Changmin are out for a night on the town in the storyline – but to me this is just a giant excuse for bromance shenanigans! What girls? They ignore them all (hehehe!) and just have fun dancing. The track is upbeat and fun, with a great hook in the chorus. I really like the ‘big band’ direction that they’re taking at the moment with all the brass and swing motifs. The single is out on June 11 – but for now we can enjoy the PV!